Stunning Sea and Mountain Views from villa, private pool & garden. Various spaces around house. Ideal for families & groups. Cumbre del Sol, just above Moraira/El Portet with Cafes. Casa Inca is a beautiful, comfortable villa, very well-equipped with a lovely swimming pool and incredible views! The cyclists in the family were challenged by the steep hills but pleased to see the Tour de Spain had passed close by. Moraira is a very nice town and we would like to explore more of the area. John and his wife were extremely responsive to our requests. We had a very happy holiday indeed and hope to go back. The location of the house was fantastic with a view that is hard to describe. The functionallity of the house is perfect for espially for a family bringing as well children as grandchildren. 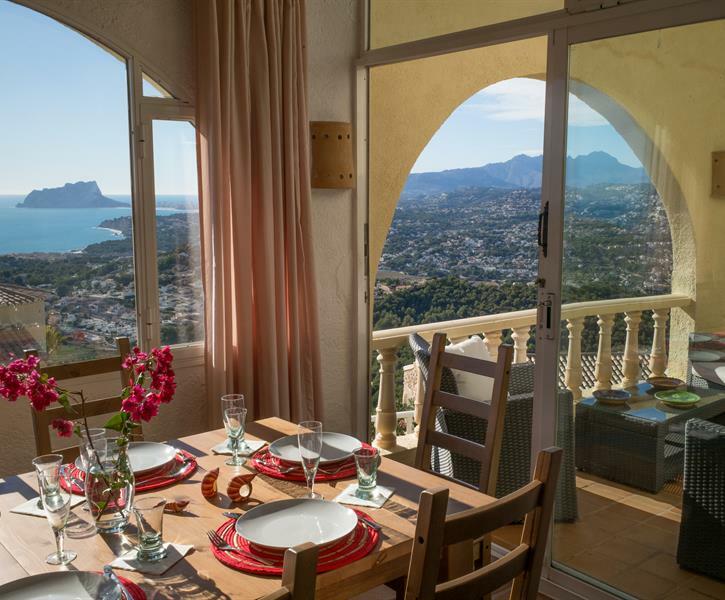 Short distance to the nice town of Moraira and to very good beaches. Casa inca was a lovely villa and the photos of the view do not do it justice! The villa is spacious and was very clean, tidy upon arrival. The villa is great for children, and how lovely to discover toys for the pool and chairs and parasols for the beach were provided! You definately need a car as villa is right at the top of the hill but is only a 2 min drive down to the nearest supermarket, Mercadona. It is only 5 mins or so to drive into Moraira so really easy to get to the beach. Its very peaceful up at the villa so nice for families! Very much recommend this villa for both adults and families! Fabulous location and great holiday! Thank you very much!! The whole family had a great time, and we would like to say thank you. As our teenage daughter said: it was actually as beautiful as the pictures, which is rarely the case. Everything was clean and tidy and well-functioning. If there was the slightest issue, it was treated right away and with personal assistance and local presence. The house was perfectly arranged for our need, where we could have the small kids close to us and the teenagers in the 'tower' with their own bathroom. The pool was an absolute delight and kids and adults spent hours in it several times a day (we had chosen to pay for heating the pool which was an excellent choice for us). The view was magnificent and we enjoyed it every single day and evening. The beaches in the area where plentiful and very diverse, so both the young kids and the teenagers found things to explore and enjoy. The neighborhood was very beautiful and very quite - maybe because this was the beginning of the summer holidays, but we enjoyed it. I can highly recommend this beautiful place which absolutely lived up to our expectations, and the owner made us feel very welcome all the way from reservation to the end of the vacation.